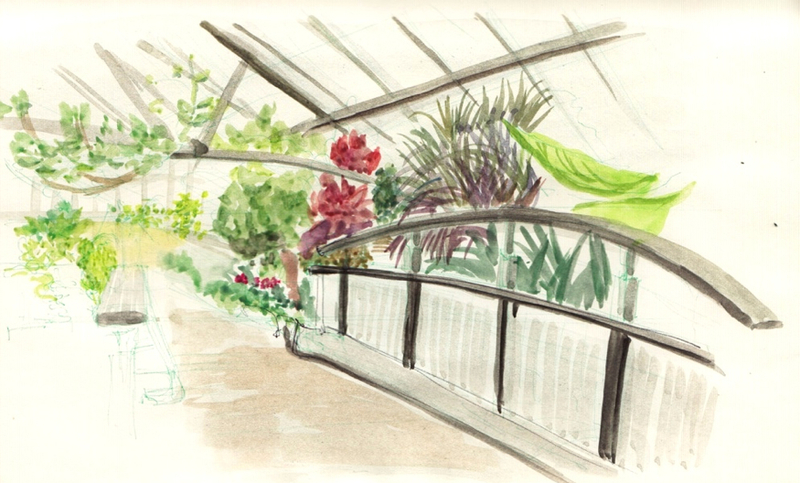 Last weekend, Sketching Around the City had a meetup at the Allen Gardens. It's a park and indoor botanical garden right in the city which includes six greenhouses. It's a great location to paint plants in the winter. During the holidays, they have a poinsettias on displays and special holiday decorations. It was a little overwhelming to pick a spot to draw, but it was a great opportunity to practice watercolors. I managed to do two sketches and tried to concentrate more on colors than structure, forcing myself to get out of my comfort zone when it comes to sketching. We had a great turnout. 21 people showed up and did a great job. You can see more photos on the meetup group page.